Orchids have a reputation for being fussy or hard to grow. 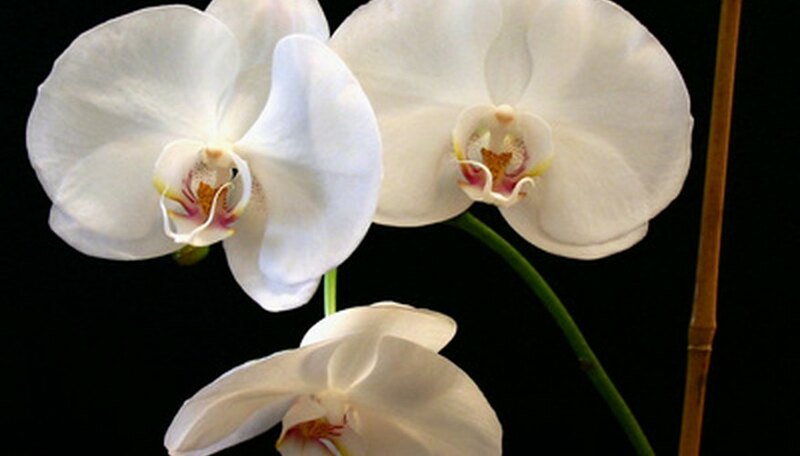 In truth, most orchid plants are actually very simple to care for. Orchids such as phalaenopsis will grow well in the lower light conditions of a home with just the right amount of watering and a good container. Clear plastic containers are a popular choice among professional orchid growers, because the clear plastic allows the growers to inspect the root system of orchids for signs of rotting. Orchid growers who wish to grow their plants in a more decorative container may choose to place the plastic container inside a second pot. Orchid growers who plant orchids using this method can simply slip the inner plastic container out of the outermost container to check the condition of the root system. Clay containers are breathable and heavy. The weight of a terra cotta container provides stability for orchids. Additionally, the porous nature of terra cotta allows the roots to breathe so that the soil does not develop fungus. To increase the air circulation among the roots of orchids, some terra cotta containers come with decorative holes drilled throughout the containers. Orchid potting mixes, which are primarily made of larger chunks of bark or sphagnum peat moss, have larger particles that do not fall through the holes in terra cotta orchid containers easily. Basket containers are another popular container type for orchids. The baskets allow more air circulation than terra cotta or plastic, which helps to prevent the roots from rotting and discourages diseases. However, because baskets provide more air circulation, the roots and soil of basket-planted orchids dry out faster. Due to this, orchids planted in baskets must be watered more frequently. Baskets may be traditional baskets made from woven strips of fiber, or they may resemble boxes made of slats with wide spaces between each slat. Coir fiber is made out of the compressed fibers of coconut husks. These containers are an environmentally friendly alternative to plastics due to the fact that they are all-natural and biodegradable. Coir fiber containers breathe as easily as basket containers, which helps to discourage mold, mildew and root rot. Coir fiber pots will last up to 5 years through regular watering before the containers begin to degrade.